The FV4202 is a Rank IV British medium tank with a battle rating of 6.7. It was introduced in Update 1.63 "Desert Hunters". As the prototype of the Chieftain, it features the heavy sloping armour of the Chieftain on the chassis of a Centurion tank. 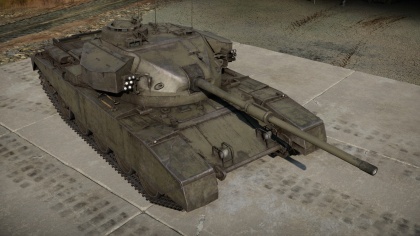 The FV4202 gives the player a very good insight on what to expect on the future of the Rank IV and V medium tanks of the British Ground Forces. Featuring a very sloped frontal armour and the powerful high-penetrating cannon. The FV4202 is also relatively mobile for its armor and weight, this can be used to push towards the enemy. When in movement, keep in mind the turret armor and lower frontal glacis as these are prominent front weak points of the FV4202. The FV4202 is a British medium tank. It has sloped frontal armour, a well rounded and thickly armoured turret and a powerful 84mm gun with access to APDS ammunition. The first thing that you may notice when you first get the FV4202 is that the stock 20pdr gun is far more effective than the stock 17pdr gun, due to the fact that you start with APCBC ammunition, which is far more effective than the 17pdrs purely AP stock rounds. This makes it far more forgiving than tanks like the Centurion MK1 or the Challenger. When fighting in a low rank game, it can be a game changing tank. It can easily take out Tiger I and Panther tanks at long range whilst remaining resistant to enemy fire. Even Tiger II tanks are vulnerable to the 84mm gun, though their gun poses a big threat to you, especially at long range. When you get up-tiered, you will face far more challenging enemies. With a BR range of 5.7-7.7 you can face the Jagdtiger, Leopard I , IS-6, IS-3, IS-4M, the T-54, and even the Maus if you're playing realistic. These are all highly resistant to your APDS (even from the side in the IS-3/IS-4M case), and have extremely potent armament. When you get up-tiered the weaknesses of the FV4202 start to show. To start, it has a very poor reverse speed. As a British tanker, you will have experience with similar issues from vehicles with the Cromwell chassis, but the FV4202 has nowhere near the mobility, so it is difficult to quickly escape from a bad situation as it was with Cromwell based tanks. The frontal armour is thin and so is particularly vulnerable to high caliber HE shells. Also, although thickly armoured, the turret has some flat parts which are easily penetrated by many tanks of the BR. Finally, there are only four crew in the tanks, three of whom are in the turret. A turret penetration may knock out the entire turret crew and destroy the tank. Aiming for the LFP (Lower Frontal Plate), with an effective thickness of around 150mm, is probably the easiest place to go for when targeting the FV4202 from the front. By doing this, you are both taking out the driver and ammo. Aiming for the plate under it to take out the transmission and possibly the driver is also an option from the front. If your tank has a more powerful gun, aiming for the upper cupola or weak spots such as the gun mantlet or armour cheeks is possible. Tanks such as the IS-2 can also aim for the upper roof of the tank as HE shells can take out this armour while knocking out most, if not all, of the turret crew. If countering the FV4202 from the side, the skirt armour and tracks can sometimes catch a shot or two. Instead, aim for the side of the turret if a possibility. As all three turret crew members are located here, as well as the gun breach, this is generally a good idea. Especially noting that three of the four crew are here, taking this shot into consideration as a possible way to instantly incapacitate the tank. 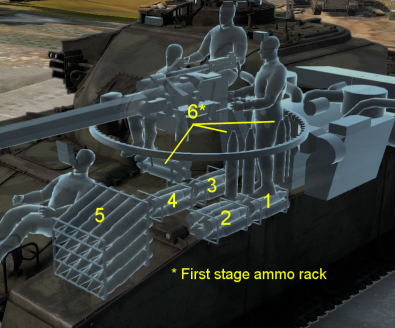 When taking a larger amount of shells, ammo racks are located just under the turret also, so when possible also take this into consideration. Preferably do the same when engaging from the rear. When using any aircraft, it is possible to penetrate the thin 8mm of armour above the engine compartment, making this an easy shot. Hull down: Due to the good gun depression and strong turret armour, the FV4202 performs well in a hull down position, where only the turret is visible to the enemy. Some maps are better for this tactic than others. It involves looking for a good spot overlooking a capture point or a large open space, setting up a good defensive position and then picking off enemies that come into your sights. This way you will be a lot more difficult to destroy as enemies can only get glancing shots on your sloped and rounded turret. Sniping: With APDS, the 84mm is a very precise and accurate gun. Therefore, it is effective at taking out targets at long range. It is extremely satisfying sniping enemy tanks at the other end of the map. This is a good tactic for the FV4202, where you can hang back, retain the effectiveness of your armour and pick off enemy tanks at your leisure. Just ensure to change position every few shots to avoid getting bombed or knocked out by another tank. When you get down tiered, Tigers, Panther, IS-1/2 and T-34s can be leisurely picked off at range while you remain largely immune to their hits. Front line tank: Particularly when down tiered, the FV4202 makes an excellent front line vehicle. It's main gun can counter any threat, particularly Tiger I and Panther Tanks, whilst its heavily sloped armour and strong turret allows it to bounce some hits. This allows you to push capture points and takeout enemy tanks on the move with your stabilizer. Be careful not to over extend. The FV4202 is very vulnerable from the sides. If you over extend you will open up your flanks and become vulnerable. Instead you should get to a comfortable place and then initiate a hull down tactic. Tiger II (P)/(H): With a BR 6.7, the FV4202 is more than likely to see a Tiger II in the field. If encountered in the front, aim for the cheeks of the turret, the right side to knock out the gunner and render the Tiger II unable to fire. Use this opportunity to withdraw for a better vantage point for more capable tanks to destroy the Tiger II or for the enemy Tiger to make another mistake and get shot by the FV4202 again. Avoid getting hit by the Tiger IIs 88mm gun. It will be able to penetrate you at long range and a hit will most likely knock you out. IS-2 (mod. 1944): Another common heavy tank enemy. If it is the regular IS-2, the 20-pounder can easily penetrate the hull armor and the turret cheeks (right side again for the gunner). The mod. 1944 is more complicated due to its improved frontal armor so it is important to be able to target the turret cheeks to knock out its fighting capability. Like the Tiger II, the IS-2 has a very powerful main gun. A direct hit will almost certainly destroy the FV4202 in one hit. T29: American heavy tank capable of outright destroying the FV4202. Frontal glacis and turret armor near impenetrable in the front. Aim for the lower glacis or even a glancing shot on the turret side for a chance to penetrate the armor. A39 Tortoise: This heavily armored vehicle prevents the FV4202 from penetrating its frontal armor, the only weak point being the commander's location and that is not a good place as the 20-pounder does not have a lot of post-penetration damage. Best case is to simply withdraw and attack it from the sides. Panther II: Unlike the first Panther series, the Panther II's frontal armor cannot be penetrated by the 20-pounder, plus it has the famous 88 mm gun so more caution is needed. However, just like the Tiger II, aiming for the turret cheeks can ensure a disabling of the vehicle to take advantage of. 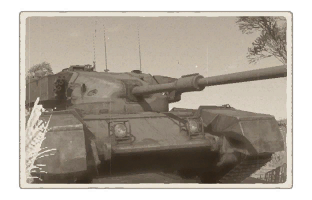 IS-6 : The IS-6 is one of the most challenging vehicles that you face at this rank. It is fast, very well armoured and has a powerful gun. Despite the fact that it is a premium, it is very common. You will face it often. It can easily bounce the 84mm APDS from the front and even the sides. If angled properly the IS-6 is very difficult to displace. It is not invincible though. Firing at it from high ground can reduce the effectiveness of its angled armour and HEAT-fs is good for penetrating it's armour, so working closely with other tanks is important. Maus : The very sight of a Maus on the battle field can be enough to make some players turn tail and run. It is an extremely menacing opponent to face on the battlefield, and its huge 128mm gun will have no trouble taking you out of the game. Even the 75mm coaxial gun can damage your main gun and tracks, if not penetrate the FV4202 from the side. Luckily, the Maus is not invincible. With APDS you can penetrate turret cheeks and side armour relatively easily, but sometimes your rounds will simply pass through the massive superstructure without doing very much damage. The internal layout of the Maus is quite complex and is lined with extra 20mm plates of armour, protecting crew members and modules from internal shrapnel. Destroying the Maus in one shot is extremely difficult, so it is often best to retreat after a successful hit. Jagdtiger : The Jagdtiger is armed with the same devastating 128mm gun as the Maus, which is absolutely deadly if it hits you. Couple this with formidable frontal armour and you have a very dangerous opponent. Try to flank this opponent or hit the flat superstructure on the left and right of the main gun. Decent mobility for the size. Heavy punching 84 mm 20-Pounder "Quickfire" Gun can penetrate most enemies seen at BR. Very strong loped frontal armour able to withstand most shells fired at the FV4202. Resistant to Russian 85mm and German 88mm KwK 36 at long range. Has a stabiliser which allows for accurate fire on the move. Has a low profile compared to other British tanks of the same rank such as the Centurion Mk. 3. Unlock-able APDS shell for heavier targets. Overall thin armour yet sloped. LFP (Lower Frontal Plate) is generally weak and most penetrative hits will take out driver and ammo rack. A part of the soft turret armour is near a flat weak point. Vulnerable to air attacks from planes with heavier guns as engine roof armour is lacking. Although a small target, there is an 89 mm weak spot right above the gun. Shots penetrating this, in particular APHE may knock out the turret crew. The cupola on top of the turret is a deadly weak spot. One penetration from APHE will take you out. Solid shot only, no explosive filler. Especially noting APDS' lack of post-penetration damage and shrapnel. This page was last edited on 13 January 2019, at 19:35.